← What Time Should You Wake Up? 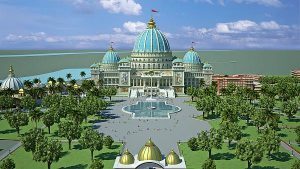 In the Indian city of Mayapur—the world center of Vedic spiritual culture—a very unusual temple is being erected, which, according to the Vedic predictions, will change the fate of the entire planet. Authorities of Vedic knowledge say that it is after the opening of the Temple of the Vedic Planetarium that the long-awaited Golden Age – the revival of spirituality on planet Earth – will commence. 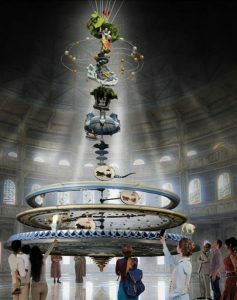 The Temple of the Vedic Planetarium is named as such because within one of its main domes it will house a 3-dimensional, moving model of the universe according to the Vedic scriptures appearing in the shape of an incredible chandelier. Great Indian Saint A.C. Bhaktivedanta Swami Prabhupada gave his disciples the order to build this temple on voluntary contributions collected all over the world. Despite the fantastic scope of the imagination, Srila Prabhupada had a clear idea of what the new temple should be like. He has left numerous statements, instructions, and explanations. He wanted the Vedic Planetarium to have no equal, revealing to people the Vedic concept of life. The Vedic Planetarium would directly challenge the accepted modern version of the universe, and establish the legitimacy of the Vedic version, as well as use science to counteract the prevalence of modern atheism. The exposition will take the viewer on a journey through the material cosmos to the spiritual world; all according to the descriptions found in the Srimad Bhagavatam, the Brahma Samhita, and other ancient scriptures. Beginning from the lower planets, pilgrims will travel up through the earthly realm and then on to the higher planetary systems before passing beyond the boundary of the material universe. Within the spiritual realm, visitors will view the various spiritual planets, before finally arriving at the topmost spiritual abode of the Supreme Lord Sri Krishna. The Vedic Planetarium features a giant rotating model that demonstrates the movements of the planetary systems as described in sacred texts. Explanations and displays are also presented that describe how these movements correspond to the visible universe of our experience. Within the planetarium the model will be studied by onlookers from different levels by use of escalators. In this regard, a model is very helpful in showing how all the planets may be considered as moving within a chandelier that is itself moving. That will explain various universal phenomena such as the passing of seasons, eclipses of the moon, etc. Cosmology is defined as the study of the origin, purpose, structure, and function of the universe. Vedic cosmology, unlike its modern counterpart, gives a vast amount of information about not only the structure of the phenomenal universe as we see it, but also a clear idea of the source of the manifested universe, its purpose, and the subtle laws that govern its operation. The fundamental concept is the relation and dependence that everything has upon the Supreme Personality of Godhead, Sri Krishna: the source of creation, maintenance, and dissolution of the manifested worlds. Although He is the ultimate cause of all other causes, His existence is beyond the material energy and He Himself takes no direct part in these activities, but indirectly controls the universe through his delegated expansions and empowered agents in the form of various incarnations and demigods. This means that behind all apparently mechanistic laws and events there is one or more person who enacts and administers the laws and controls all universal events. Accepting a Supreme controller is central to entering into an understanding of Vedic cosmology. From the Vedas and especially from Vedic cosmology, we can receive information from beyond our sensory plane or awareness that describes the hierarchy of beings within the universe, leading ultimately to the Supreme Personality of Godhead, Sri Krishna. Thus, human society can benefit greatly from appreciating and understanding this instruction and molding their life around it. As such, Vedic cosmology is not merely an attempt to understand the world around us, rather it is the process by which we understand both the world and our place within it. See also: Vedas on Creation of the Universe, Cycles of the material World, and Vedas on Cosmos. Other features of the temple complex. It is no exaggeration to say that the Vedic Planetarium will become the largest temple built in the last thousand years. The most outstanding external features of the planetarium are the three large domes with the central dome rising above the others and reaching more than three hundred feet in height. In this dome, there will be three groups of Deities. On the left side, a long chain of spiritual teachers along with Srila Prabhupada himself. In the center will be the great shining Pancha-tattva deities: Sri Krishna Chaitanya, Nityananda Prabhu, Sri Advaita, Shri Gadadhara and Sri Shrivasa, while on the right will be the magnificent Sri Sri Radha Madhava and Their close servants – the eight main gopis (cowherd girls). The width of the altar will be 140 feet. This is not surprising, since all the temple space will accommodate ten thousand people. The inner walls of the central dome will be made of the best marble, ornamented with gold inlays. The altar will be decorated with onyx, known for its translucency and fragility. The smaller right dome will become the home of Lord Narasimha (Lord in the form of the Lion Man). The temple will also house the Institute of Vedic Cosmology, which will continue research into, and discussion of the Vedic account of the universe. Even at a great distance, the view of the tallest domes of the Planetarium is fantastic! Surrounded by an elegant landscape with lawns, fountains, and lakes, it will attract many guests. Alfred Ford and the Temple. 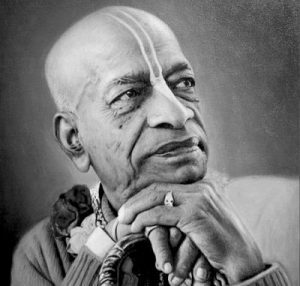 Srila Prabhupada asked his disciple Ambarisa dasa (the great-grandson of Henry Ford, the head of Ford) to help build the Vedic Planetarium. Having accepted this instruction as the meaning of his life, Ambarisa dasa pays for most of the expenses. The temple would have 6,750,00 square feet of covered area, of which Alfred Ford himself is building 4,250,00 square feet area. The remaining 2,500,00 square feet area would be built with subscriptions from the public. Everyone can contribute towards the construction of just one square feet of the temple. The magic temple is not finished yet, so everyone has once-in-a-lifetime opportunity to take part in its construction.